Tax day is a procrastinator’s dream. The two-and-a-half months from when you receive your W-2 or 1099 to when you have to file seems like an eternity. But now it’s hit you with the urgency of a house on fire. Take a breath—the solution is right in your web browser. Dozens of online tax sites are waiting for your last-minute business. Some offer little more than electronic versions of the IRS’s paper forms, while others walk you step-by-step through the filing process. We’ve picked the best and put together a guide to making your eleventh-hour filing as painless as possible. Before you do anything, find out if you’re eligible to file your taxes for free. Taxpayers with an adjusted gross income of $60,000 or less can take advantage of the IRS’s FreeFile program, which makes tax-preparation software from 14 different vendors available for no charge. Each participating vendor has its own eligibility requirements related to income, age, state residency, military service and eligibility for the Earned Income Tax Credit. The site offers a wizard-style questionnaire to help you find the best software for your tax situation so you don’t have to manually comb through each program’s requirements. Remember Free File only covers your federal return. Each site charges extra for state returns, and prices vary by vendor. 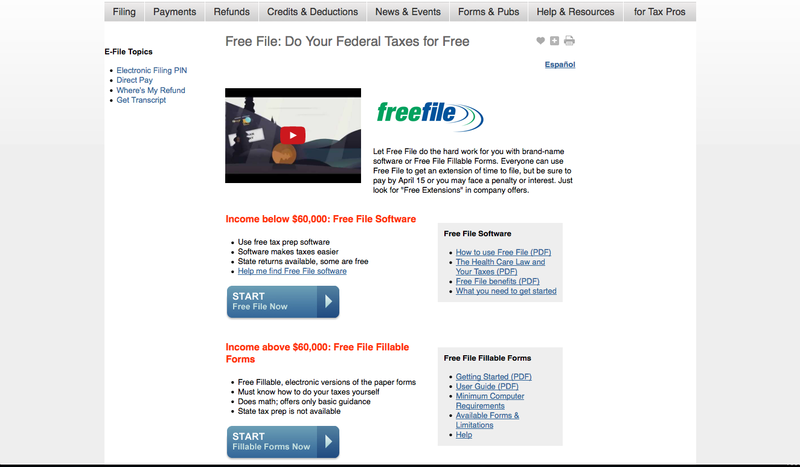 Free File makes commercial software available to entry-level and low-income filers. Even if you don’t qualify for FreeFile, you can use FreeFile Fillable Forms. Accessible from the FreeFile page, these are basically electronic versions of the IRS’ hard copies that you can fill in and file online. Because these don’t provide the question-and-answer prompts that most tax programs do, they’re best suited for people who have experience filing paper tax returns. Fillable Forms do not support state returns. You may also be able to file for free with a commercial vendor if your tax situation is relatively straightforward. 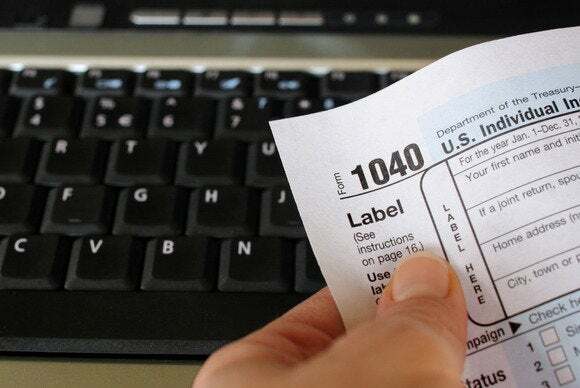 TurboTax, H&R Block, and TaxAct each have free options for filing simple 1040, 1040A, or 1040EZ. State returns cost extra—$20 for TaxAct and $30 for TurboTax and H&R Block. 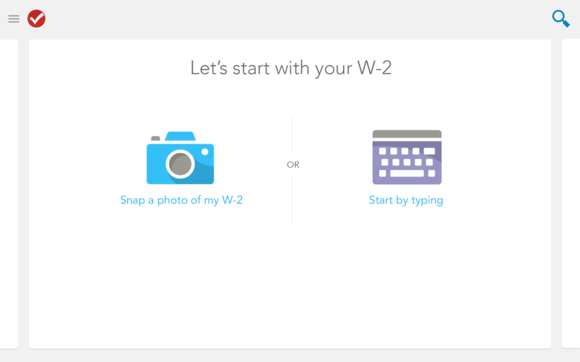 These options offer automatic import of your W-2, accuracy reviews, and answers to common tax questions. If you don’t qualify for one of the above options, your best bet is to avail yourself of one of the Big Three paid services: Turbo Tax, H&R Block, and TaxAct. There are less-expensive services than the first two, but they offer little more than what you can get gratis from FreeFile Fillable Forms, and they can’t match the features and polish of the leading packages. All three vendors offer multiple tiers of their products, with prices increasing with the complexity of your tax situation. If you’ve used one of these vendors before, it’s simplest to stick with them because you’ll be able to import data from last year’s return. When it comes to features and ease of use, Intuit’s TurboTax is still the mack daddy of tax preparation programs. It offers three tiers of service—Deluxe ($55), Premier ($80), and Home & Business ($105)—and it will point you to the appropriate one by having you check off items that apply to your situation. Whichever package you end up using, expect to tack on $40 for a state return. 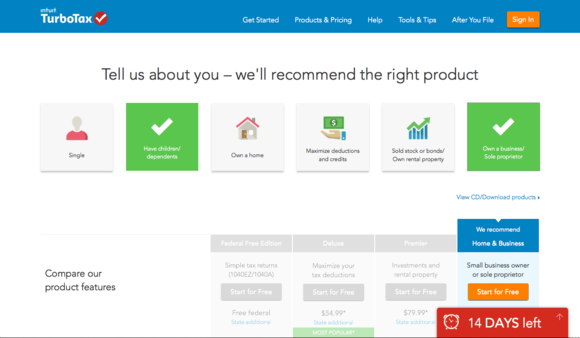 TurboTax’s interview-style wizard points you to the appropriate product for your tax situation. 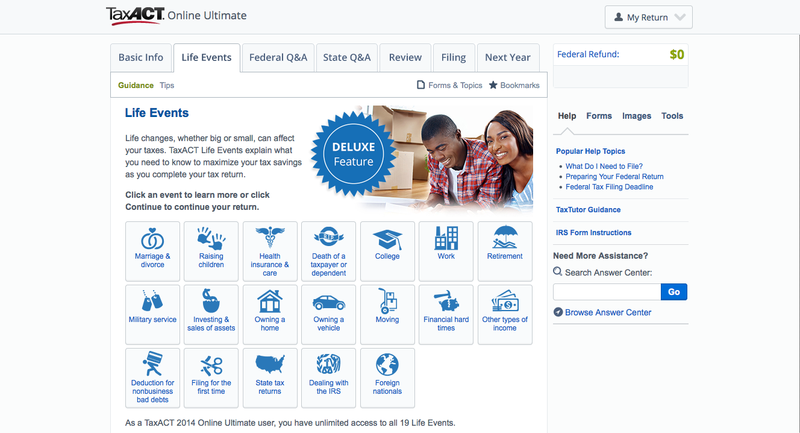 TurboTax remains the priciest of the big three but it also has the slickest interface, best data import support for W-2 and 1099 forms, and plenty of assistance through free access to tax experts and an active user community. This year, TurboTax continues its Amazon gift card refund program. If you e-file using Deluxe, Premier, or Home & Business and you opt to receive your refund on an Amazon gift card (in denominations of $100), TurboTax will add 5 percent to it. So, if you decide to put $500 of a refund into a gift card, you’ll get a card for $525. The offer is good up to a maximum of $2000 per card and $10,000 per customer. H&R Block also offers three paid options: Basic ($35), Deluxe for homeowners and investors ($50), and Premium for the self-employed or rental property owners ($80). State returns are an additional $40. All tiers include data import support, plus guidance on deductions, home mortgage interest, and more depending on the package. H&R Block’s online packages come with plenty of pro support. Block’s differentiator continues to be its network of tax pros, which is available for tax advice as well as in-person audit support should you need it, all at no extra cost. Block also offers a Best of Both service: For an additional $100, you can have the federal return you’ve prepared reviewed, fixed, and filed by one of its tax preparers. Like TurboTax, Block offers a refund bonus program, sweetening the pot if you put some or all of your refund toward the purchase of a gift card from one of more than 40 retailers including Best Buy and Target. Refund receivers using Basic will get 5 percent added to their card amount, while Deluxe and Premium users can look forward to an additional 10 percent. Historically TaxAct has been the bargain offering of the Big Three, and that’s still the case. Its state-and-federal Ultimate Bundle, which includes e-filing, is an unbeatable deal at $22. Opting for just their Deluxe Federal package will set you back only $13. But what you save in fees, you lose in features. 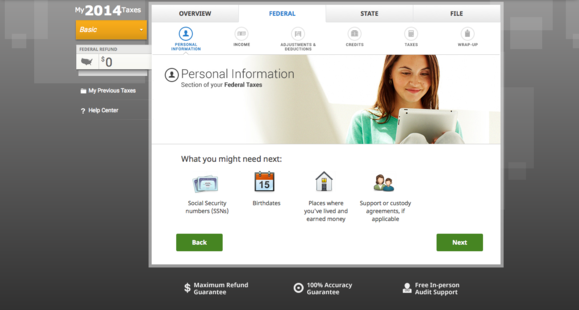 TaxAct’s interface isn’t fancy, but it will walk you through the tax prep process. TaxAct’s interface isn’t nearly as streamlined as those of its two biggest competitors. There is a fairly robust library of text and video assistance on a variety of common tax topics, and tax help via phone is available as part of the Ultimate Bundle. But if you’re on a budget and you don’t need a lot of hand-holding, TaxAct may be your best bet. Previously, TurboTax offered two separate mobile apps: SnapTax , a smartphone app for the most uncomplicated filings, and TurboTax for iPad, which mirrored the Deluxe edition and higher packages. This year, it has wrapped up everything in a single app that includes the full TurboTax product lineup, so now everyone can use it regardless of the complexity of their return. The ability to move seamlessly between your phone, tablet and PC gives added flexibility for where and when you do your taxes. It’s free to download for iOS and Android devices. A benefit of a tax-prep app like TurboTax’s is being able to snap a photo of your W-2 to import its data. H&R Block and TaxAct’s mobile offerings are still comparatively limited. The H&R Block 1040EZ Tax App lets you prepare a simple federal and state income tax return, while the H&R Block iPad App allows for more complex returns and lets you move between it and your desktop browser. The same goes for TaxAct’s smartphone app, TaxAct Express, and its tablet app. Whichever option you choose, don’t put off filing your taxes any longer. The closer you get to tax day, the more procrastinators like you will be flocking to these sites to meet the deadline, potentially creating a logjam. So grab your tax form and your receipts, and get started. Correction: This article mistakenly stated that tax help by phone is not available with TaxAct. It is available with the TaxAct Ultimate Bundle. PCWorld regrets the error.